The lines are painted, scoreboards are in place, Gatorade is on chill and the city of Duncan, South Carolina is set for another weekend of high-flying 7-on-7 passing tournament action. The annual Palmetto State Showdown hosted by Byrnes Rebels Football will commence this weekend for the sixth consecutive summer. No matter what day of the year you travel through downtown Duncan you’re bound to see a Byrnes Rebel flag flying on almost all streetlights. The city supports their Rebels as much as any elite high school football fan base and small town in America . In all respects the Rebels are Duncan, where eleven South Carolina state football championship trophies are displayed in the trophy case. It’s the summer now and it’s the time of year Duncan shows its true colors. They open the city to all comers, so long as your game for some competitive passing tournament football. “Oh yes Rebels football is serious around here even in the summer. They have the tournament and everybody talks about it at work and around town because you know there are some good teams in it. They do a good job with it,” one resident responded while leaving a local store. Seventeen high school football teams from four states will be vying for a spot in the National Select 7-on-7 Championships presented by Under Armour in Hoover, AL July 24-26. The winner and runner-up earn spots to the National Tournament if they elect to take it. Sixteen of the seventeen teams made the playoffs in their respective classes in their respective states in 2012. Byrnes (SC), Bergen Catholic (NJ) and Valdosta (GA) will each field an “A” and “B” team in the event for twenty teams total. Gainesville (GA), winners of Georgia’s Class 5A, is the lone state champion in the field and are led by highly touted quarterback and Clemson commit Deshaun Watson. Bergen Catholic (NJ), Jack Britt (NC) and Union County (SC) were state runner-ups in their respective classes in their state. Joining Watson will be other key prospects including Watson’s future teammate at Clemson ATH Jae’lon Oglesby of DW Daniel (SC). Oglesby has rushed for over 4,000 yards in his career. Byrnes (SC) will feature a pair of players in quarterback an Old Dominion commit Shuler Bentley (106 TD passes the last two seasons) along with teammate wideout Sheadon Meadors. Bergen Catholic has a pair in tight end Garrett Dickerson and linebacker Cameron Querio (Northwestern). Other prospects include Southern Durham (NC) wide receiver Maurice Trowell, Wren (SC) quarterback Jacob Clary, North Gwinnett (GA) wideout Nate Brown and running back CJ Leggett, Louisville commit JT Foster of Union County (SC) and a pair of 1,000-plus yard rushers from Jack Britt (NC), Eric Carter and Marquis Foshee, will be among scheduled to join their teams. Bergen Catholic out of Oradell, NJ will have the longest trek to Duncan. The Crusaders will be making their third consecutive appearance and in past years fly in for the showdown. The Crusaders were the runner-up last season posting a 13-1 record losing only to Byrnes in the title game. Byrnes went 13-1 also losing to Bergen Catholic in pool play on a Hail Mary pass on the last play of the game. Safe to say the Rebels got their revenge winning on their last offensive possession of the title game on a Shuler Bentley touchdown pass in the back of the endzone. “We’re excited about this year. This event keeps growing, we have great people working with us and we have a tough competitive field again this year. We plan on continuing to grow it,” tournament director Tony McAbee said. 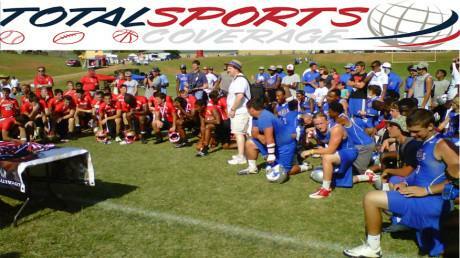 7-on-7 passing tournaments are becoming more and more popular from coast to coast. 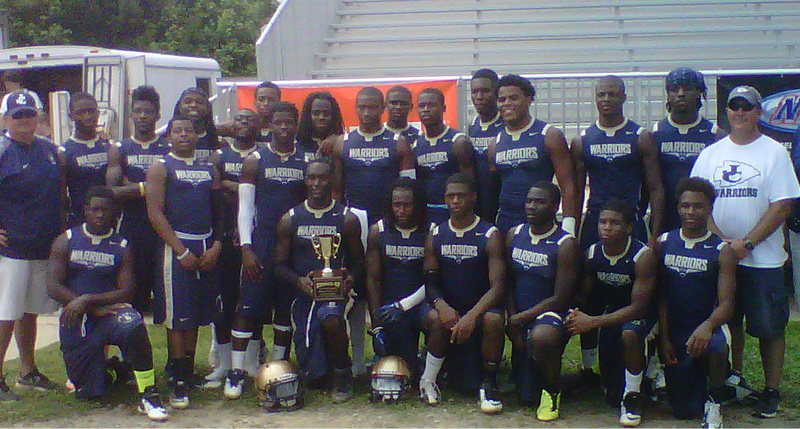 The Palmetto State Showdown receives national recognition yearly because of the teams and prospects that participate. This will be the second consecutive year the showdown has been apart of the National Select 7-on-7 Championships, which has crowned a champion every year since 2001. In the previous five years, Brunswick (GA) is the only team from outside of the state of South Carolina to win the showdown, winning in 2011. Host Byrnes (SC) kept the title at home winning in 2008, 2009 and 2012 while Wren (SC) won in 2010. The complete field by state is listed below. Pool play games will begin Friday morning at 8:30am EST and continue into Saturday morning before the single-elimination tournament begins Saturday afternoon. Follow the action on Twitter by following @Byrnes7on7 and @select7on7. Amid much speculation that this would be the final minor league football game for minor league veteran and former Carolina Panther and Tennessee Titan Detronn Harris, he went out with a bang if indeed it was his last, leading the No.1 seeded Georgia Bandits to the 2013 National Developmental Football League championship defeating the third-seeded Middle Georgia Wolfpack. Trailing 6-0 after a Wolfpack touchdown by Chris Payne entering the third quarter, the Bandits scored 13 unanswered points a taking 13-6 lead on two Detronn Harris touchdown passes to Jherail Rhodes and Jameel Mitchum. Harris completed ten consecutive passes including the two touchdowns at one point in the third quarter. Middle Georgia would not go quietly despite a strong defensive effort in the second half from the Bandits. With less than two minutes remaining in the fourth quarter, Middle Georgia quarterback Steven Williams capped a drive with a touchdown pass to pull the Wolfpack to within one at 13-12. Special teams, as is the case on the minor league level, was Middle Georgia’s Achilles Heel. The Wolfpack missed both extra point attempts, including a botched snap on an attempt. Ty Barnes and his squad were unable to recover from that and their ensuing onside kick and the Bandits ran out the clock for the win. “I saw some things they were doing on offense and I let our defense know and we able to take their running game away, especially the way Greg [Edwards] played, stuffing them up the middle that was huge for us,” Harris stated. Harris was named the 2013 NDFL championship game MVP and 2013 NDFL Offensive Player MVP by the league and has conducted two different minor league football organizations to championships in the past four seasons. Harris’ previous championship came in 2010 with the Gwinnett/Georgia Jets in a 7-0 defeat on a bad ankle however he threw a game-winning touchdown pass in the final seconds over the Atlanta Chiefs who ironically were led by current Wolfpack quarterback Stephen Williams. For his efforts Harris earned the league MVP honors that year in the Southern Football League. Harris was not alone in winning another minor league title as linebacker Greg Edwards, wide receiver Demetrius Griffin, defensive back/linebacker Trae Hille and quarterback Chris Smith were all on the 2013 Bandits title game roster as they were in 2010 with the Gwinnett/Georgia Jets. Once featured by ESPN The Magazine in their October 2010 “Body Issue”, with current Phoenix Mercury star Diana Taurasi gracing the cover in the buff, for his efforts and contributions to minor league football, Harris continued to hint that this was his final game albeit leaving the door slightly ajar for a return. Many would be quick to reference Super Bowl winner and famed Green Bay Packer quarterback Brett Favre, Harris is far from that as we’ll outline in an upcoming Total Sports Coverage exclusive with him later this summer. 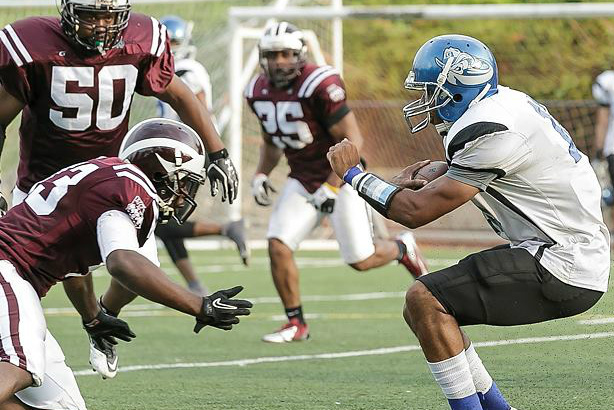 The Bandits defeated the Georgia Rebels and Georgia (Douglas County) Riverdogs in their previous rounds of the NDFL playoffs to advance to the championship game. By virtue of winning the NDFL championship the Bandits also won the Continental Conference in the APDFL. We have confirmed via the ADPFL league office that the Bandits season is not complete. They have the option to play for both regional and national implications in the coming weeks. The ADPFL office has confirmed that the Continental Conference winner (Georgia Bandits) will face the SSFL Champion on June 29th. 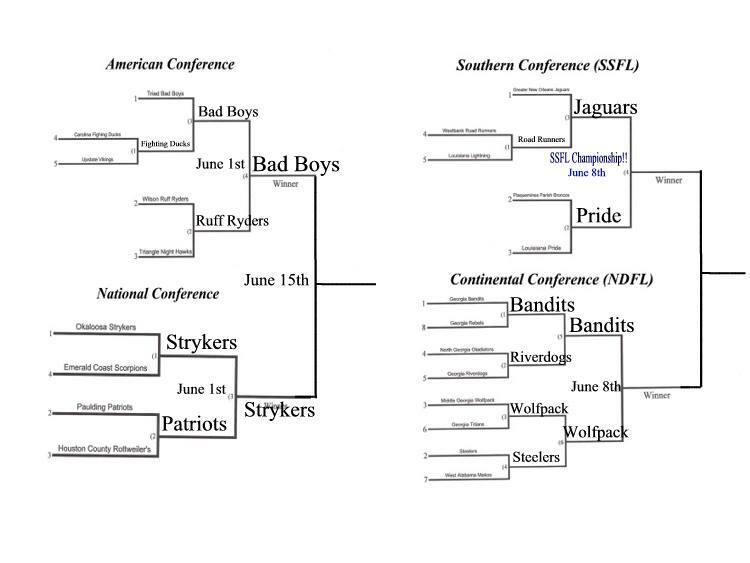 The Bandits/SSFL winner will face the National/American Conference winner for the ADPFL championship according to the ADPFL, brackets are below. The Cedar Shoals Jaguars went 4-6 last season under first-year head coach Chris Davis. Coming up on his first full year of taking over the program, Davis is taking the Jaguars into new territory as they attended the Auburn University High School 7-on-7 event this past week. Cedar Shoals has taken part in FCA 7-on-7’s in the past yet this level of competition was different with the likes of Prattville (AL), Brynes (SC) and DeSoto Central (MS) among others. “We had a terrible first day,” Cedar Shoals head coach Chris Davis said. The Jaguars went 2-5 during pool play on the first day but rebounded on the second day defeating Prattville (AL), Jefferson Davis (AL), Callaway (Hogansville, GA) and DeSoto Central (MS) in the tournament portion of the event before losing to Callaway in the B Flight Finals. When it was all said and done Cedar Shoals finished 6-6 overall at the event. Rising senior Quvntay Burdette and rising Breon Mitchell held their own at their receiver spots while rising freshman Ryan Huff- who led his 8th grade team in INTs last season and Trevor Burgess stood out with solid showings in the secondary. Cedar lineman Frank Wilson won the Most Improved Lineman Award at the event. 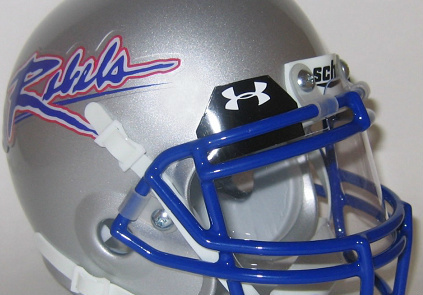 Byrnes just keeps improving while continuing to win. After losing head coach Chris Miller to Spartanburg (SC), the Rebels promoted offensive coordinator and offensive guru Bobby Bentley to head coach to lead the program again. It is Bentley’s second stint as head coach of the Rebels. If that were not enough, the Rebels went into the state of Georgia and hired North Gwinnett’s defensive coordinator Mo Dixon to run their defense. During his time at North Gwinnett under head coach Bob Sphire, all Dixon did was garner rave reviews from Sphire while helping the Bulldogs to seven 10-plus winning seasons and three region crowns in the hotbed of high school football talent that is Gwinnett County (GA). 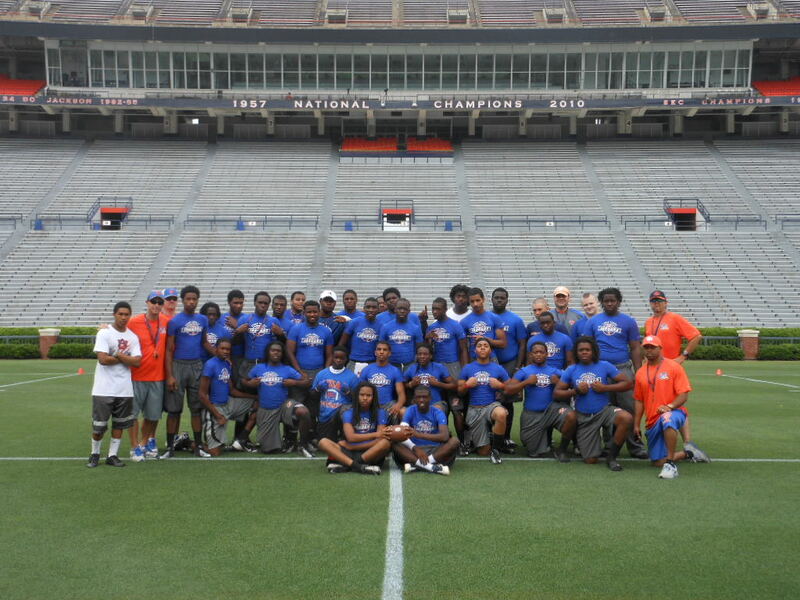 During pool play Cedar Shoals went up against nationally known and respected Byrnes out of nearby Duncan, SC. 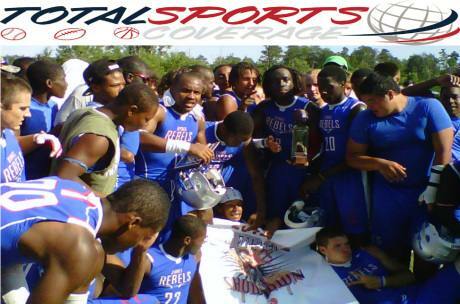 The Rebels got the best of the Jaguars enroute to winning two titles. Shuler Bentley (ODU) and Shaedon Meadors shined for the Byrnes “A” championship team while rising freshman Jake Bentley (verbal to Auburn) and Micah Young carried the “B” team. “They have big time swagger,” Davis said of Byrnes. “This could be one of their best teams particularly depth wise, they are loaded and [Shuler] Bentley (Byrnes QB who has passed for 8,200+ yards and 106 TD the past two seasons) is the real deal,” Davis added. Byrnes will host the South Carolina Qualifier, also known as the Palmetto State Showdown, of the National Select 7-on-7 Championship Series next weekend (July 14th and 15th) in Duncan, SC. The Rebels have won three of the previous five tournaments. Brunswick (GA) will be in the field and are the only team from outside of South Carolina to win the event doing so in 2011. Wren (SC), located in the Greenville, SC is the only other team from South Carolina to win the event in the previous five years. Byrnes was not ranked in the early Max Preps Xcellent Top 25 as Northwestern (SC) was the lone South Carolina team to land in the Top 25 however odds are they will finish there with Shuler Bentley & Co. looking to win another state title while Gaffney (SC) led by Shaq Davidson and Hyleck Foster along with several others, will be hot on their tails. The Olive Branch Conquistadors went 11-2 during the 2012 season while earning their ninth consecutive state playoff appearance in the state of Mississippi, losing in the quarterfinals to Madison Central (MS). They started a summer season filled with 7-on-7 passing tournaments across the southeast this week with a perfect showing at the opening event of the National Select 7-on-7 Championships Series. 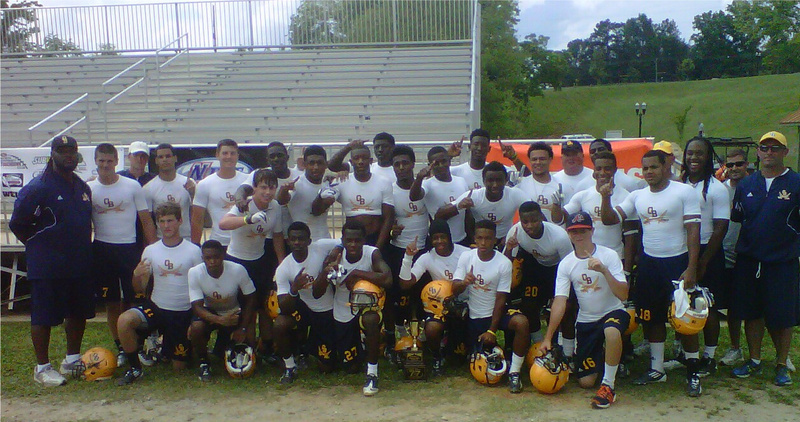 Olive Branch finished 11-0 overall at the North Gwinnett Regional Qualifier earning them a spot at the National Select 7-on-7 National Championships in Hoover, AL July 24-26 if they elect to take it. Olive Branch completed pool play on Thursday with a 6-0 record earning them the No.2 seed after losing seeding tie-breakers to No.1 seed Alpharetta-who also finished 6-0 in pool play, for the double-elimination tournament on Friday. The Conquistadors would roll through the winners bracket of the tournament 5-0 defeating Cherokee, Central Gwinnett, Centennial and completing their perfect showing with two consecutive wins over 12th-seeded Jefferson County (GA). Their first win over Jefferson County came in overtime 26-25 to advance to the championship game and the second was for the championship winning 20-12. Conquistadors wide receiver Warren Dewalt was named the tournament’s top performer. DB Alfred Dickens, DB Devonta Davis, S Clay Casey, QB Ross Trail and DL Chris Matthews are players to watch for Olive Branch as the summer continues and the fall approaches. Despite being dressed out, Matthews did not play yet was very vocal and supportive of his teammates throughout the final games of the tournament, evening giving words of advice to several Jefferson County players when they approached him afterwards. Olive Branch averaged 24.3ppg during the qualifier and were one of two teams outside of the state of Georgia to compete in the event. The Spartanburg (SC) Vikings under the direction of first-year and former Byrnes (SC) head coach Chris Miller finished 5-3 in the event overall was the other. Byrnes (SC) was the defending champion yet did not compete in this year’s North Gwinnett Qualifier. After a 2-4 pool play record, Jefferson County made a solid run during the tournament defeating No.5 Jonesboro, No.4 Archer (Lawrenceville, GA) and No.8 Grayson (2012 Runner-Up) before losing to Olive Branch (MS) twice in the end. The Warriors would defeat the losers’ bracket winner No.3 Centennial to earn their second shot at Olive Branch in the championship game. Jefferson County finished 6-6 overall in the North Gwinnett Qualifier getting solid play from QB Will Jordan, WR J.D. Roberts, RB Coby Jackson, DB Randall Williams and DB Dustin Smith among others.